A newly formed Network Functions Virtualization (NFV) ISG under ETSI will hold its second meeting on April 22-23 at Huawei's facility in Santa Clara, California. The NFV initiative came about when leading network operators began to discuss a common approach for adapting SDN and open innovation principles in their networks. The initiative now has representation from at least 13 leading operators: AT&T, BT, CenturyLink, China Mobile, Colt, Deutsche Telekom, KDDI, NTT, Orange, Telecom Italia, Telefonica, Telstra, and Verizon. 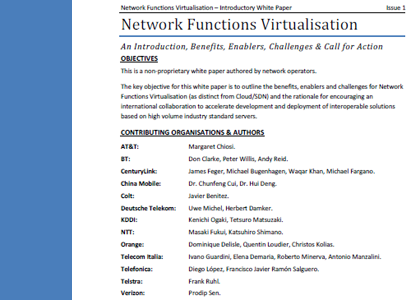 A joint white paper on Network Functions Virtualization was published in Oct. 2012 (see link below). Subsequently, the ETSI Board approved creation of the NFV ISG in November 2012. Network Functions Virtualization aims to implement key network capabilities in software running on standard servers and employing cloud virtualization techniques. The early design goals, as outlined at the last OFC/NFOEC by Christos Kolias, Sr, Research Scientist, Orange Silicon Valley, call for multi-versioning and multi-tenancy of network functions, which would allow use of a single physical platform for different applications, users and tenants. NFV would also enable new ways to implement resilience, service assurance, test and diagnostics and security surveillance. NFV benefits to service providers could include reduced equipment costs through equipment consolidation on high volume, industry-standard servers, greater scalability, software-oriented innovation, and time-to-market. NFV and SDN are seen as largely complementary, but not necessarily dependent on each other. Italy's WIND plans to invest about EUR 1 billion over the next five years to upgrade its network to LTE. The carrier has selected Huawei as is lead supplier for the project. Sirti SpA is named as a local technology partner. Huawei described the contract as among its biggest projects in Europe to date.